We often see people getting confused between gamification and game-based learning. However, the objectives, results, and implementation methods of each one are totally different. 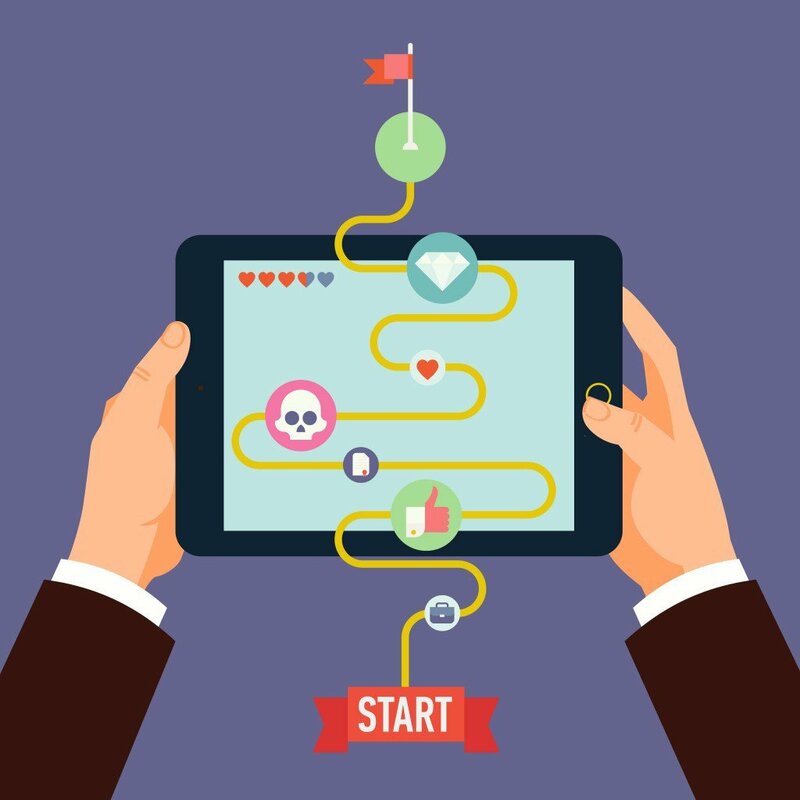 Gamification strategies are increasingly getting attention and investment in eLearning. In today’s high-pressure world, when everyone is working tight schedules, we tend to learn well only when it’s enjoyable or obviously beneficial to us – and games definitely make the learning more enjoyable. According to Engagement Alliance, the gamification industry is predicted to reach $5.5 billion by 2018. Games keep learners engaged and motivated – 80% of learners feel that game-like learning or jobs could make them more productive (Talent LMS). But it’s high time that we get gaming concepts right; let’s have a look at what each of these means. Gamification means applying the game design techniques and game mechanics to engage and motivate learners to help them achieve their goals. In gamification, the learning process as a whole is turned into a game. Game mechanics and elements are applied to existing content to engage and motivate the learners. Might include a collection of tasks with some form of rewards (without necessarily any defined learning objective). Points, levels, rewards, leaderboard, achievement badges, feedback loops, conditions are some of the key principals used in gamification. It is usually easier and cheaper to introduce gamification in learning. It encourages collaboration, fun, focus, retention, productivity, creativity, and meaningful choices. It is a great way to change behaviors or encourage specific behaviors, provide immediate feedback and gratification, and track progress. When you want to encourage the learners to take specific actions. When you want to motivate the learners and influence their behaviors. When you want to drive innovation and help the learners in building specific skills. When you wish to engage the learners while promoting the spirit of competitiveness. When you wish to provide the learners ways to track their own progress. Keep the game mechanics and structure easy to understand and follow. Carefully align gamification with the business needs and learning goals. Make scoring and winning easy and transparent – keep simple rules and keep the leaderboards easy to understand. Bunchball, in partnership with Wall Street Survivor, launched an online education platform which uses gamification to teach investment strategies to Millennials. Through a series of engaging and rewarding missions, users are taught a variety of stock market concepts. Enterprises use Keas, an employee wellness platform, to maintain the overall health of the organization, lower group health insurance costs, and reduce unnecessary sick days. The gamification in Keas provides the individuals with a personalized dashboard which shows the stats, allows them to earn awards for achievements on task completion, and also support the co-workers to help them achieve their goals. Game-based learning is a teaching approach where the learners explore the relevant aspect of games in a learning context designed by teachers. In game-based learning, games are used as part of the learning process. Game-based learning is aimed at teaching a specific skill or achieving a specific learning outcome. Game-based learning includes the content which is created to fit the story and scenes of the game. It helps in drawing the learners into the relevant virtual environments that they are familiar with. It is usually difficult and expensive to build game-based learning. It helps in motivating and influencing the learners in a positive way. It helps in providing context and engaging the learners. It helps in rememorizing the concepts in a fun way. It reinforces and consolidates the knowledge in a friendly environment. When To Use Game-Based Learning? When you want to repackage existing academic content. When you wish to promote critical and strategic thinking amongst the learners. When you want to engage and motivate the learners who are otherwise not engaged. When you want to support the struggling learners in learning better. Focus on the learning objectives. Strike the right chord while making it challenging – it should not be too easy and, at the same time, it should not be as difficult as to frustrate learners. Make the games interactive and immersive so that the learners can remain focused on the goals and objectives. McDonald’s launched game-based learning system to its 300 restaurants; it allowed the employees to learn and practice in a safe environment online. The game was addictive, fun, and with well-thought learning objectives. It made the learning experience memorable with targeted skill and knowledge training. It helped the employees in improving their accuracy and reduce the service time by close to 8%. Microsoft’s Ribbon Hero game teaches the learners how to use the Microsoft Office’s ribbon interface. This game has “Clippy”, the helpful paperclip, as the game’s protagonist. While the objective of learner engagement is common between gamification and game-based learning, they are two different things. Both offer tremendous benefits to your eLearning course, but it is important to know the different between the two so that you can optimally use the one which is relevant for the desired goals and the needs of the learners.